Researchers Patricia A. Champion and Matthew Champion from the University of Notre Dame’s Eck Institute for Global Health have developed a method to directly detect bacterial protein secretion, which could provide new insights into a variety of diseases including tuberculosis. The Champions point out that bacteria use a variety of secretion systems to transport proteins beyond their cell membranes in order to interact with their environment. For bacterial pathogens such as TB, these systems transport bacterial proteins that promote interaction with host cells, leading to virulent disease. Previously, researchers have relied on methods that have fused enzymes or fluorescent markers to bacterial proteins to identify bacterial genes that are used to export bacterial proteins into host cells. However, these methods can’t be used in the analysis of all bacterial secretion systems, which has limited understanding of the mechanisms that bacteria use to interact with host cells. 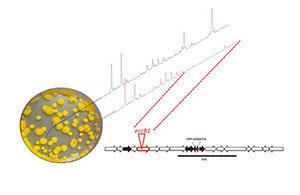 The Champions developed a modified form of bacterial proteomics using a MALDI-TOF mass spectrometer, which directly detects the proteins from whole colonies by ionizing them with a laser. This research revealed that the method was able to specifically monitor a specialized form of protein secretion, which is a major virulence determinant in both mycobacterial pathogens, such as TB, and Gram-positive pathogens, such as Bacillus and Staphylococcus species. The Champions demonstrated that this new method is applicable to the study of other bacterial protein export systems that could not be effectively studied under previous methods. Their method could also help in the identification of compounds that can inhibit bacterial protein secretion. The method’s importance can be seen in the fact that there are approximately 2 million fatal TB cases each year, mostly in the developing world. Also, antibiotic-resistant strains of TB are appearing increasingly. The Champions’ research findings appeared in the journal Molecular and Cellular Proteomics. The research was funded by the National Institutes of Health and Notre Dame’s Center for Rare and Neglected Diseases as well as capitalization funds from Notre Dame. Originally published by William G. Gilroy at newsinfo.nd.edu on September 17, 2012.